Do you already have an account with ContentMX? If you already have an account, click on the Sign in with Microsoft button. You will be asked to provide your Microsoft login credentials. If you have more than one Microsoft login, you will be asked to choose one. Provide the appropriate password, and if you have enabled Two Factor Authentication you may be asked to provide a passcode as well. 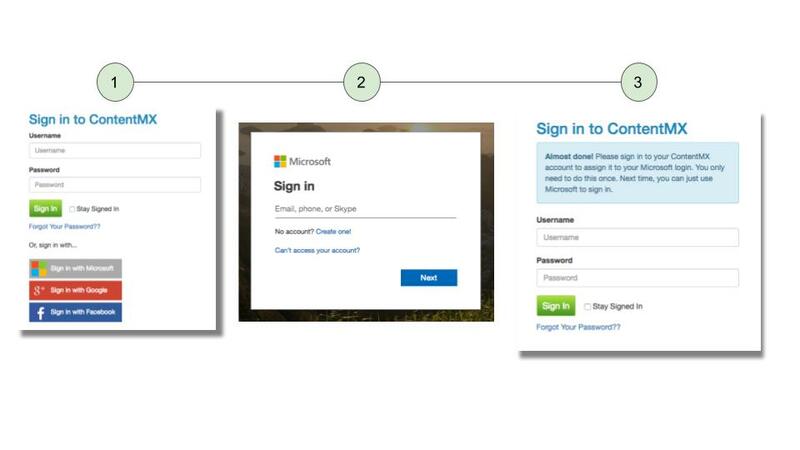 If this is your first time using the Sign in with Microsoft button, you will then be asked to sign in to your ContentMX account using your account username and password. This authentication is used to connect your ContentMX account with your Microsoft login. The next time you click to Sign in with Microsoft, just provide your Microsoft credentials and you will be provided immediate access to your account. If this is your first time using ContentMX, you must first create your account. To use a Microsoft Login, you must first establish an account. Go to the account sign up page that has been provided to you. During the sign up process, you will be asked to choose an account username. Once this step is completed, you will receive an email with a temporary password. Use this temporary password to sign in to your account and change your password to a secure personal password. Next, log out of your ContentMX account, and click the Sign in with Microsoft button. Follow the steps above to complete the connection to your ContentMX account.